The agreement has been welcomed for a number of reasons. First, it is said to represent a definitive defeat of climate change denial and a victory for rational thinking. Second, with the agreement, we undertake action on a global scale to enhance the prospects of especially future people. Third, if taken seriously, the agreement will contribute to reducing our dependence on fossil fuels (and on some dictatorial regimes) as well as promoting sustainable innovation. I would like to add another reason. It does not happen very often that the world reaches a unanimous, legally binding and (potentially) substantial agreement about climate change or other issues of global justice. Climate change concerns the whole world, but this world is characterized by enormous differences in wellbeing, health, education and living standards. Geopolitical relationships, international tensions, and diverging agendas and interests are to be reckoned with as well, and there is an inverse relationship between responsibility for causing climate change (which lies mostly with the rich) and vulnerability to the problem (which is closely connected to poverty). It therefore seems appropriate to call the Paris Agreement historical: the global context notwithstanding, 196 countries have succeeded in reaching a unanimous, legally binding and substantial agreement about the future of the planet. I would not go so far as to call it an empty box, although I do agree that the agreement’s success depends on how the principles and national contributions are translated into practical actions and policy measures to be taken in the following days, years and decades. Such actions and measures need to be quick and resolute, but at the same time, their effectiveness and fairness need to be subjected to continuous critical scrutiny. Nonetheless, the success of the agreement will not only depend on its translation into practical action and policy, but also on additional factors, of which I would like to discuss three. The ultimate goal (article 2, paragraph 1(a) of the agreement) is to limit global warming to well below 2°C above pre-industrial levels and preferably to 1.5°C. In fact, the lower the temperature increase turns out to be, the better: even the 0.9°C we experience today already negatively affects the global climate and vulnerable people. To achieve this target, each country (or at least the majority of countries) submitted its own climate action plan – its so-called intended nationally determined contribution (INDC) – that specifies its intentions to reduce emissions. James Hansen rightly dismisses these plans for only containing intentions and promises. Without practical action, these INDCs remain hollow words. On numerous occasions, the Paris Agreement already mentions that ambitions should increase. The most specific provisions determine a global stocktake of the collective efforts in 2023 and every five years thereafter (article 14). However, it does not contain any specific guidelines on how to enhance ambitions. Despite the fact that it is a legally binding agreement, it does sanction countries for not achieving their targets or for too weak ambitions. Positive incentives to promote effective action are lacking as well. Moreover, in the agreement as well as in discussions about it, there appears to be a lack of practical strategies to convince others and ourselves to enhance ambitions. The routine of annual marathon-meetings is preserved, yet bilateral consultations, a ‘coalition of the willing and able’, and a collaboration with corporations or organisations should be given full opportunity as well. Moreover, not only international negotiations and agreements hold the key to success, environmental organisations, climate activists and individual citizens/voters should keep up the pressure on their governments and the international community to scale up ambitions. Furthermore, the global collection of national climate action plans does not take into account cross-border efforts of multinationals or international partnerships between cities in a meaningful way, yet another lacuna that should urgently be addressed. In its INDC, the EU has specified that it will reduce emissions by 20% below 1990 levels, by 40% before 2030, and by 80-95% by 2050. In comparison with other major emitters, these targets are rather ambitious, albeit still not sufficiently adequate. Thanks to some effective policy measures and the economic crisis in 2008, today’s emission levels in the EU are already 18-19% below 1990. 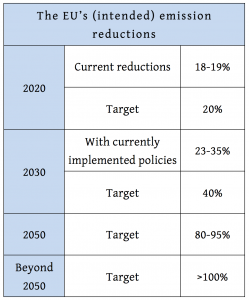 Hence, achieving the first target (a 20% reduction by 2020) will not require huge additional efforts. 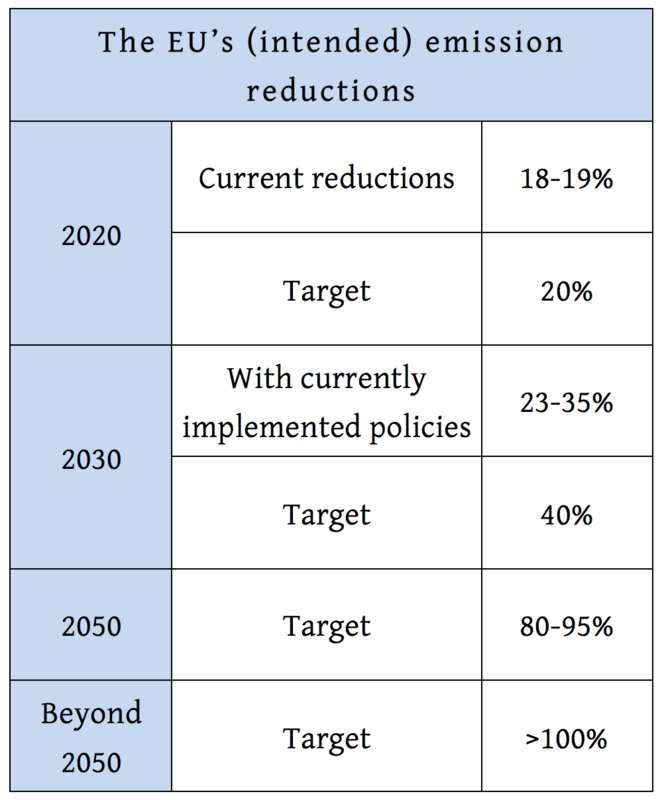 Considering the 2030 target, currently implemented policies are projected to reduce domestic emission by 23-35%, which means that we would have to increase our efforts in order to achieve a 40% reduction. However, these extra efforts vanish into thin air in comparison with the efforts required beyond 2030: by 2050, the EU intends to reduce its emissions by 80-95% below 1990 levels. More importantly, if global warming really is to be limited to 1.5-2°C, European emissions would have to become zero or even negative shortly after 2050. This illustrates my first point that even the EU (being one of the more ambitious parties to the negotiations) should substantially increase its ambitions. However, I would also like to make a second point: in the longer-term context, we should not attach too much importance to intermediate goals or targets. The lower emission levels will be, the more difficult further reductions will become. A significant amount of initial emissions cuts are relatively easy to achieve, but afterwards it will get harder and harder to reduce emissions: in the longer term, we will need zero-carbon energy sources, technologies to sequester carbon and a radical change in the mentality of consumers, corporations and governments. The relationship between the EU’s efforts before and after 2030 is therefore even more problematic: more ambitious intermediate targets would give us more time to address the tougher emission reductions. Intermediate targets also contain some political risks. We should not allow such targets to result in never-ending negotiations or haggling over percentage points and some euro’s. Of course there should be fairness in the distribution of benefits and burdens, but such machinations to take as little effort as possible in achieving a collective intermediate goal are futile and unacceptable in view of the requirement to totally decarbonize society in only a few decades. A second political risk is that governments will cling to their intermediate targets (imposed by themselves or the EU). More specifically, intermediate targets carry the risk of slowing down progress because they are not sufficiently ambitious. Take for example the EU’s easy target to reduce emissions by 20% below 1990 levels by 2020. More ambitious measures may be postponed until after 2020, because they are superfluous for achieving the first target, even though they will be necessary to reach other targets along the way. Further investments and developments will then be delayed as well, negatively affecting ecology and economy. In general, the sooner and deeper emissions cuts can be made, the larger the benefits for ourselves, the rest of the world, and future generations. Intermediate targets should not become counterproductive in achieving the crucial longer-term goal of a zero-carbon society. Article 9 (paragraph 3) of the Paris Agreement holds that developed countries should continue to take the lead in mobilizing climate finance from a wide variety of sources, in order to meet the needs and priorities of developing countries. The Parties to the agreement have formally agreed to jointly mobilize at least USD 100 billion per year by 2020 for the Green Climate Fund in order to assist developing countries in their mitigation of and adaptation to the changing climate. As of November 2015, 38 countries (including the wealthiest) have made pledges amounting to the grand total of USD 10.2 billion. Similar to the national emission reduction plans proposed in the INDCs, there is thus an urgent need to increase contributions. Reaching the target of USD 100 billion per year should be a piece of cake in view of the total wealth of the world (in 2014, the world GDP amounted to USD 77,870 billion ). Nonetheless, the budget of USD 100 billion will probably be insufficient to assist developing countries in facing climate-related challenges: the World Bank has calculated that the cost of adaptation will be in the range of USD 70-100 billion a year between 2010-2050. Even though this study adopts an unambitious mitigation pathway (leading to a temperature increase of 2°C in 2050), we can still assume that the major part of the Green Climate Fund will be allocated to adaptation (even when voluntary donations manage to provide the proposed budget of USD 100 billion). However, developing countries also need assistance to reach their mitigation targets, and to enhance the quality of life of their people in a sustainable way. In addition, sustainable development requires a large transfer of technological and scientific knowledge, which cannot be expressed in monetary terms and which is not straightforward either. Such transfer is mentioned in inter alia article 6 (paragraph 8) and article 10 of the agreement, but practical guidance on implementation is lacking. Once again, the question arises as to how to proceed. There is a substantial risk that mere voluntary contributions will always fall short. In the past, such non-binding targets did not suffice either. For example, in 2014, only 5 countries succeeded reaching the UN target of reserving at least 0.7% of their GNI for Official Development Aid. There is a real risk that, with the system of voluntary contributions, the richest countries will congratulate themselves even with contributions that fall far short of being sufficient or equitable, at the expense of the poorest and most vulnerable people. Instead, we should devise a fair distribution of the burdens determining exactly who should pay what exactly. There are already some sophisticated allocation systems, for example combining responsibility for the problem (a Polluter Pays Principle) with capacity (an Ability to Pay Principle) to determine how much countries/individuals/corporations should contribute to mitigation and adaptation to climate change. Agreeing on a precise formula as well as legally binding national targets will be arduous, but at least more clarity about fair shares is required to piece together the necessary funds in a way that is fair for donor countries and reliable for developing countries. The Paris Agreement’s first litmus test is its ratification. On 22 April 2016 (Mother Earth Day), the Agreement will be opened for one year for signature. The agreement will enter into force after 55 countries that account for at least 55% of global emissions have deposited their instruments of ratification. This threshold is sufficiently low to be realistic, but the question remains how many countries in the end will ratify the agreement. How many countries will remain true to their willingness to cooperate and how can we persuade backpedaling countries to join in after all? I remain optimistic – albeit cautiously. Even though the framework set out by the Paris agreement remains to be translated in effective action and policy measures, I think it is a sign of hope that the gathered countries have succeeded in agreeing on this framework, despite their extensive social, economic, political and ideological differences. We can only hope that the largest number of countries will ratify this framework in order to maximise its salience. Perhaps we will then also succeed in effectively reducing emissions, increasing national ambitions, prioritising the longer-term goal of a zero-carbon society, and supporting sustainable development in developing nations in a robust way. In this way, I am hopeful that the Paris Agreement will be able to prove not to be an empty box, but on the contrary a historical landmark in global climate policy. 1. U.N. Secretary-General Ban Ki-moon, quoted in Joby Warrick and Chris Mooney, ‘196 countries approve historical climate agreement’, The Washington Post (12 December 2015). I owe these points to Johan Braeckman, who formulated them in a thoughtful blog post (in Dutch). He also mentions that the agreement would reduce the risk of freeriding. I am not convinced about this point, because the agreement does not contain sanctions or incentives to ensure sufficiently ambitious national climate action. I will return to this issue below. Also see Frank Biermann, ‘Planetary boundaries and earth system governance : Exploring the links’, Ecological Economics 81 (2012), pp. 4-9, at p. 6. Quoted in Oliver Milman, ‘James Hansen, father of climate change awareness, calls Paris talks ‘a fraud’, The Guardian (12 December 2015). Climate Action Tracker, ‘Paris Agreement: stage set to ramp up climate action’ (12 December 2015); Climate Equity Reference Project, Fair Shares: A civil society equity review of INDCs (2015), p. 5. Climate Action Tracker, ‘Rating countries’ (2015). In Belgium, we know all about this. After six years of negotiations, it was only with the pressing deadline of the Paris negotiations that our regional and federal governments managed to reach an agreement about the implementation of the previous agreements (concerning the second phase of the Kyoto Protocol, from 2012 to 2020). For this reason, Belgium was rightly ‘honoured’ with the Fossil of the Day award on the first day of the Paris negotiations. The Paris Agreement still uses the language of developed and developing parties. For simplicity’s sake, I will adopt this language as well, although I should mention that this differentiation between countries has since long been surpassed by the rise of a global consumption elite, the increasing power of multinational corporations and a growing gap between rich and poor in even the richest countries. Green Climate Fund, ‘Pledge Tracker’ (2015). The World Bank, Economics of adaptation to climate change. Synthesis report (Washington DC: The World Bank, 2010), p. 19. OECD, ‘Aid to developing countries rebounds in 2013 to reach an all-time high‘ (2015). For a philosophical account, see Simon Caney, ‘Climate change and the duties of the advantaged’, Critical Review of International Social and Political Philosophy, 13 (2010), pp. 203-28. For practical applications in the evaluation of INDCs , see the Climate Action Tracker and the Climate Equity Reference Project. Hi Lisa. Thanks for this comment. Your question is not at all naïve: assumptions regarding technology are a central issue in climate change mitigation. In general, and as far as I can see, policymakers and negotiators indeed rely substantially on further technological developments. They might not envision radical breakthroughs per sé, but most certainly take a sheer infinite potential of technology to solve environmental problems for granted. These developments could make it easier in the future to reduce emissions, which indeed explains the proportional spread of emission reductions before and after 2030. While techno-optimism appears to be the default position, I think we should be more cautious and realistic, but I should indeed have explained my own assumptions into more detail in order to clarify my argument. Many assumptions about the potential of technology ultimately depend on the development of carbon-negative technology (carbon removal / capture and storage). I agree that, in the end, we will need it to curtail global warming. However, there are pervasive questions about its safety, costs and the possibility to deploy it on a large scale. These problems may be solved through further R&D, but the unchallenged assumption that carbon-negative technology will form a comprehensive solution somewhere in the future is too contentious to be the basis for current policy. In contrast, currently existing technologies would already allow us to reduce emissions significantly more and much sooner than the Paris ambitions. Their large-scale deployment would not only mitigate climate change, it would also buy us more time to develop new technologies. Moreover, since private corporations are said to be more likely to invest in countries with ambitious INDCs, increasing short-term ambitions might create a climate for private investment. Regarding the second part of your question, there is much wording and reliance on technology development and transfer, but (as far as I know) there are no explicit targets for public investment in R&D, neither in the agreement, nor in the INDCs of individual countries. I think the problem of our inability to predict the future (in the sense of assigning probabilities to possible scenarios) and, worse, our overconfidence in our very tenuous predictions is underappreciated. In my mind, it’s the bear that eats all consequentialist theories. The general approach of these theories, not unreasonably, typically adopts the stance that ‘we should simply adopt the best estimates that we can’ but say nothing about the possibility that our best estimates are simply not good enough. In any case, it’s a pretty tough question to ask – how certain you must be, how good should your prediction be, if they are to be used in these kinds of analyses? Even if, unlike me, you don’t reject consquentialism on the grounds that we simply can’t make good enough predictions to make it viable, surely you think that there’s some threshold of probability as to what kinds of predictions should be considered. I haven’t heard people offering compelling arguments about this matter, though there is invariably an implicit assumption that some predictions are good enough (even if obviously uncertain) and others aren’t. But there isn’t a disagreement on this matter so some people may disagree because they sincerely have a different standard about this matter. Thank you for your challenging comment. My concern about techno-optimism is indeed partly based on the cautious attitude you summarize aptly. However, there is also some actual evidence to challenge techno-optimism. For example, each technology has a remaining ecological impact (for example, the production of photovoltaic cells or wind turbines, the land requirements for the production of energy from biomass, …). Moreover, there is a real risk for rebound effects because of increased population, consumption, displacement of consumption and growth in other sectors (cancelling out 20-60% of environmental savings of new or more efficient technologies). Furthermore, as I mentioned in my response to Lisa’s comment, carbon negative technologies face pervasive questions about safety, costs and scale of deployment needed to even make a dent in the accumulation of GHGs in the atmosphere. These problems might possibly be solved in the future, but, indeed, given the stakes, it is safer not to rely on such technologies for our climate policy. So people might indeed object to my position by challenging my basic assumptions about predictions/uncertainties/probabilities. However, techno-optimism is not based on actual evidence of what is likely and unlikely either. It has at least equally contentious basic assumptions about the potential of technology to solve our problems, and yet it is more or less taken for granted by policymakers and much of the general public (that is my intuition anyway). In this sense, I agree that our inability to predict the future and our overconfidence in our predictions should be challenged more. However, since my realist position as well as techno-optimism faces this problem, we are back to cautiousness. ‘Given the stakes’, I’d rather err on the safe side.